Parents: Generalmajor Maximilian and Mathilde (née Steinhel) Halder. Wife: Married Gertrude Erl on 23 September 1907. 30 June 1902: Passed Abitur or school leaving exam and university entrance acceptance from the Theresien Gymnasium (High School) in München. 14 July 1902: Entered the Royal Bavarian Army as a Fahnenjunker in the Bavarian 3. Feldartillerie-Regiment Prinz Leopold. 1 March 1903-February 1904: Detached to the München War School. 1 October 1906-31 July 1907: Detached to the Bavarian Artillery and Engineer School. 1 October 1911-31 July 1914: Detached to the Bavarian War Academy in München. 2 August 1914: Ordnance Officer on the staff of the General Command of the Bavarian III Army Corps. 6 January 1915: Chief Supply Officer (Ib) in the General Staff of the Bavarian 6th Infantry Division. 28 December 1916; Operations Officer (Ia) in the General Staff of the Bavarian 5th Infantry Division. 26 March 1917: Transferred to the General Staff of the 2nd Army. 14 June 1917: Transferred to the General Staff of the 4th Army. 12 July 1917: Senior Planning General Staff Officer of the Commander-in-Chief East/Pniowno District Command. 30 October 1917: Static Position General Staff Officer for the Mörchingen District of the Bavarian XV Reserve Corps. 5 November 1917: Leader of Rear Staging Area Command 16, Trient. 1 December 1917: Senior Planning General Staff Officer of the Army High Command 2. 20 December 1918: Adjutant of the Central Office of the Bavarian General Staff. 1 October 1919: Consultant in the Training Department of the Reich Defense Ministry. 1 March 1920: Aide Officer in the Training Department of the Reich Defense Ministry. 30 July 1920: Transferred to the staff of the 7th Division, München. 17 August 1920: Assigned to the Commandant of München. 18 January 1921: General Staff Officer on the staff of the Commandant of München. 1 October 1921: General Staff Officer and Tactics Instructor of the Leader Assistant Courses on the staff of the 7th Division, München. 1 October 1923: Commander of the 4th Battery of Artillery Regiment 7, Landsberg am Lech. 15 June 1925-17 July 1925: Detached to the Training and Firing Course at the Senne Troop Training Area. 1 December 1925: Operations Officer (Ia) on the staff of the 7th Division, München. 1 April 1926: Consultant in the Army Training Department (T 4) of the Troop Office/Reich Defense Ministry. 3 July 1928-5 August 1928: Detached to the 7th (Bavarian) Motorized Battalion. 1 October 1931: Chief of Staff of the 6th Division, Münster. 1 October 1934: Artillery Leader 7, München. 15 October 1935: Commander of the 7th Division, München. 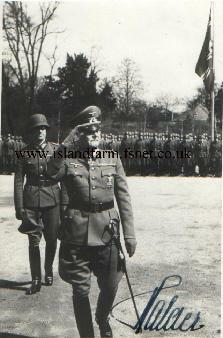 12 November 1936: Transferred into the Army General Staff. 12 October 1937: Senior Quartermaster II (Deputy Chief of Staff for Training) in the Army General Staff. 10 February 1938: Senior Quartermaster I (Deputy Chief of Staff for Operations) in the Army General Staff with effect from 1 March 1938. 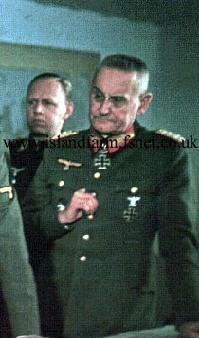 1 September 1938-24 September 1942: Chief of the Army General Staff. 23 July 1944: Arrested by the Gestapo for complicity in the 20 July 1944 plot to assassinate Hitler. 31 January 1945: Dismissed from the Army. 7 February 1945: Imprisoned at Flossenberg Concentration Camp. 7 April 1945: Transferred to Dachau Concentration Camp. 30 April 1945: Liberated by U.S. troops. 5 May 1945-30 June 1947: Prisoner of war in British and, later, U.S. captivity. 1947-1961: Head of the Historical Liaison Group of the U.S. Army Historical Division in Königstein and Karlsruhe. Prussian Royal Hohenzollern House Order, Knight's Cross with Swords: 2 October 1918. U.S. Meritorious Civilian Service Medal: November 1961. The Winds of War (1983 TV miniseries), Werner Kreindl. War and Remembrance (1988 TV miniseries), Barry Morse. When Hitler Invaded Britain (2004 TV), Malcolm Tierney.